We asked for zombie stories that showed humanity at its best, and Michelle Miller’s novel The Thirteenth Step: Zombie Recovery sort of fit the bill, but definitely wasn’t a friend of Bill. In Miller’s zombie apocalypse, the zombie virus reaches flash over proportions at the same time worldwide. As the zombies rend flesh and create new zombies, a select group of people are able to avoid zombie detection. Turns out they’re either drug addicts or they have the alcoholic gene. Bill, a PR person for the New York lottery, survives the initial slaughter as does Courtney, a Lotto winner whose dreams are dashed when zombies interrupt the check ceremony. As they fight their way to safety, Bill and Courtney slowly figure out the secret to their survival, and pick up a few other former alcoholics or children of alcoholics to round out their band. Bill, a true AA adherent who believes in meetings and fellowship, is at odds with Courtney, the bitter child of an alcoholic, who despises AA and everything it stands for. Definitely no love relationship about to brew there. The group grows to include a drug dealer, a zombie aficionado, a middle-aged woman, a former addict now Ivy Leaguer, and an illegal immigrant. Each of these characters must come to terms with the guilt of surviving while their loved ones died, as well as battle their inner demons. Let’s be honest, in a zombie apocalypse who wouldn’t want to drink or drug? When you’re surrounded by 12 Steppers, though, any use of alcohol or drugs becomes a group discussion. The wanderers do find a sanctuary of sorts, a gated community that runs by the rules of Alcoholics Anonymous. Here, everyone is in recovery and the leaders impose a multitude of rules to keep everyone on track. Up until this point, the AA story line referred to in the title mostly consisted of Bill singing the praises of AA and Courtney suspiciously eyeing everyone as if they were hiding bottles under their coats. Once the survivors arrive at the AA community, the tone shifts and suddenly AA is a cult with a charismatic leader and arranged marriages. The New York group, uncomfortable with “AA fundamentalism,” decide to leave the community and continue their search for a safe place to live. For the most part, this was an enjoyable read. The zombies were easily dispatched and posed no real threat to the survivors. Rising radiation levels were another obstacle that seemed easily surmounted and not a true threat. The danger in this story came from other humans and there’s even a reference to Jonestown in an attempt to heighten the danger when the New York group flees the gated community. Even so, this isn’t a book that will keep you on the edge of your seat waiting to see if our stalwart heroes make it to safety. The only parts of the book that kept me guessing were whether this was an indictment of AA and other 12 step programs or a very awkward tribute and the ending which was both convenient and unexpected. Still, a happy ending in a zombie novel is what we asked for and The Thirteenth Step delivered. If you’re looking for something short on gore and long on feelings, this might be for you. 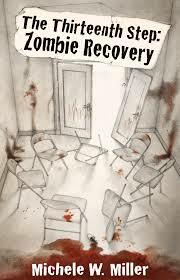 This entry was posted in Friday Book Review and tagged book review friday, Michelle Miller, The Thirteenth Step: Zombie Recovery, zombie apocalypse, zombie book, zombie infection, zombie novel, zombie story, zombies.